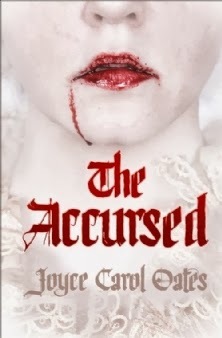 Title/Author: The Accursed by Joyce Carol Oates. Synopsis: This eerie tale of psychological horror sees the real inhabitants of turn-of-the-century Princeton fall under the influence of a supernatural power. New Jersey, 1905: soon-to-be commander-in-chief Woodrow Wilson is president of Princeton University. On a nearby farm, Socialist author Upton Sinclair, enjoying the success of his novel 'The Jungle', has taken up residence with his family. This is a quiet, bookish community - elite, intellectual and indisputably privileged. But when a savage lynching in a nearby town is hushed up, a horrifying chain of events is initiated - until it becomes apparent that the families of Princeton have been beset by a powerful curse. My Thoughts: This was an interesting novel to say the least. Joyce Carol Oates is a highly regarded member of the literary community, but I feel like I missed the point with this book, and therefore, I feel kind of dumb. It is an interesting story and involves the community of Princeton, NJ. At the heart of the book is a curse, the details of which the reader finds out at the end. But until then, there is the mystery of the curse and the events of the people who it has swallowed. Told in one of the descendent's point of view, with plenty of sidebars gave an almost omniprescient quality to the story. Including such notable characters as writers Upton Sinclair and Jack London and President of Princeton Woodrow Wilson before he became President of the United States, made it more interesting and easier to connect and relate to characters. The creepy scenes were very eerie. And really, this was supposed to be the heart of the book. But I sometimes felt as if they were not as important to the characters as they were to me. Perhaps it is because I went in with a certain mindset and the characters attribute the supernatural occurences as less then supernatural. I think I would have liked more of the creepiness, which was very detailed and gothic in feel but the book seemed to be mostly about their day to day lives during the duration when strange occurances took place. I did like many of the characters and I loved the time period of the novel, including all it's downfalls for women as second class citizens to be polished for domesticity or punished for being different. This seemed very well researched as well. High society and customs of the time were detailed, giving the events a very authentic feel. I also do have to say that the characters came to life for me, perhaps for this reason as well. Narration: Grover Gardner did a good job with the narration, considering there were so many characters. Men, women, children, upper class, boisterous and insidious were all tackled. The sensibilities of the era were well portrayed with outrage or shock as appropriate. No one character performance stood out to me, but Gardner's voice was varied enough to keep the narration from falling flat. To Wrap it Up: This is not a novel I would necessarily recommend, but I did enjoy the supernatural scenes in the book when they did occur. I often feel dumb when I try reading more literary novels. They just aren't my thing. I've read two Oates novels (Beasts & Blonde) and enjoyed them. This one though? I am struggling. It needs some cutting. It is far too long and goes off on so many dull (to me) side tangents that I can't stay focused. I'm halfway done so I might as well finish but I have a feeling it is not going to improve. @Charleen-I know exactly what you mean. @barkless-I agree with you. I think that if I hadn't been listening and had been reading print, I don't know if I could have stayed with it. Very long tangents-agreed. I am not sure what they had to do with the story. I kind of wish she had stuck with the more creepy aspects.